Sea turtles are on the verge of extinction in Sri Lanka. In order to preserve this rare species, Kosgoda village has developed a conversation project to preserve the sea turtles. This project is popularly known as Kosgoda Sea Turtle Conservation Project. The primary aim of starting this project is to monitor the behavior of sea turtle and conserve their local nestling sites. Through their program, they try to educate people about the protection of this beautiful creature. Take a tour into their sanctuary where they collect and preserved turtle’s eggs that can be hatched later, away from the predators. Hence, Kosgoda Sea Turtle Conservation Project is the must see in Bentota city. How popular is Kosgoda Sea Turtle Conservation Project? People normally club together Lunuganga and Bentota Ayurveda Centre while planning their visit to Kosgoda Sea Turtle Conservation Project. Good place to get some knowledge about turtles. 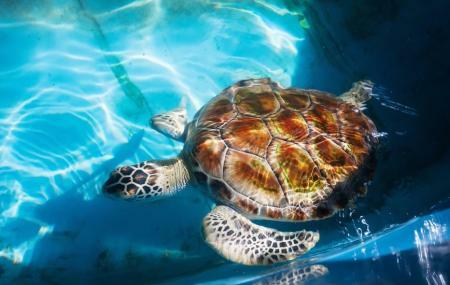 They are actively contributing to conserve sea turtles. As I remember Rs. 50 or 100 per local head and Rs. 10 or 20 for a school child. Quick visit to the turtle hatchery. Short but excellent 15 minute side trip. Turtles were in a tank that was a bit dirty and sad. Good job. Saving turtles / animals is best the best thing. Very small Sea turtle conservation area, probably famous because one of the first such conservation in Sri Lanka for the endangered sea turtles. They purchase turtle eggs from locals and hatch them in the area. They also have disabled turtles and turtles of different types and save them. The volunteers are mostly the foreign nationals who travel to the country and stay for sometime. The ticket costs around 500LKR for foreigners which is expensive for the place but one can visit the place when in and around bentota as there is not much to see other than beaches.